After four months of waiting and facing the last snowstorm, the weather changed its course within two days. The temperatures rose to above 10C after a long, long time and the snow started to melt. Today there’s hardly any snow around. In the meanwhile, the snowmelt and rain gave Thames River and its tributaries a fearsome flow. The water levels increased dramatically – a makeover to the slow, clear water that flowed calmly all winter. Spring is technically here, but the trees are yet to reincarnate themselves in shades of greens. However, the warmer temperatures did attract some creatures that I’d like to call the harbingers of spring. Spring is not only a climatic change, but many biological changes take place as well. Life blooms. It is a peak season to see migratory birds, when reptiles and mammals come out of hibernation, insects metamorphose and plants start to bud. I went on a walk around Medway Creek and Thames River, where signs of spring were everywhere. The air was filled with songs of the birds. American Robins and Cedar Waxwings have returned again. Northern Cardinals have started singing, Downy Woodpeckers are common than ever and the lovely Song Sparrows have filled the bushes with their taunting calls. I saw Canada geese and Mallard ducks flying in pairs, squirrels basking in the sun, chipmunks playing in the undergrowth and insects such as Lepidoptera (moths) and Diptera (mosquitoes and flies) already out in the woods. The Stoneflies are still around, and as abundant as they were on the previous nature walk. These are probably “attractants” to birds such as Cedar Waxwings that were seen feeding on something on the trees. This fellow is a wing-less male. I posted images of a female as well as a winged male in the earlier Medway Creek post. 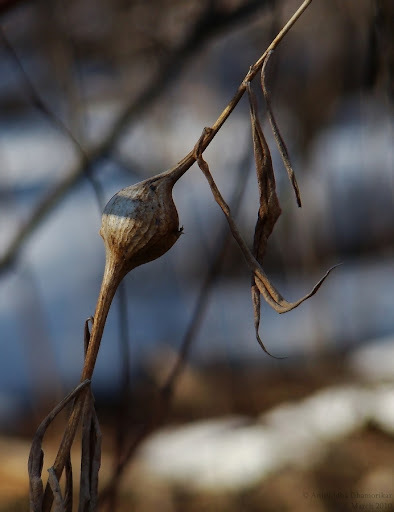 I photographed the galls on Goldenrod. 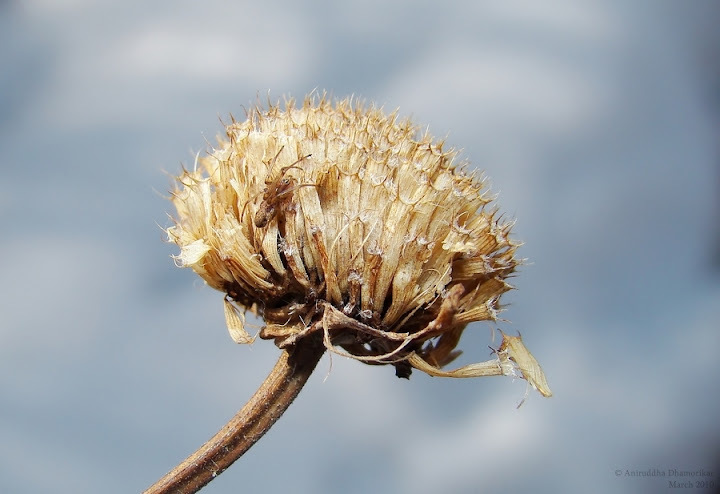 The website on Wildflowers of Ontario explains, “During late summer, a certain fly will lay its eggs on the plant. The larva burrows into the stem forming a bulge or gall ball in the stem of the plant. It will winter over and emerge as an adult in the spring.” The gall-making flies are either Midges or Gnats – belonging to Diptera, which has the largest number of gall-making insects. These galls harbor the grub of the flies, which are good source of food for birds like Downy Woodpeckers and Chickadees. 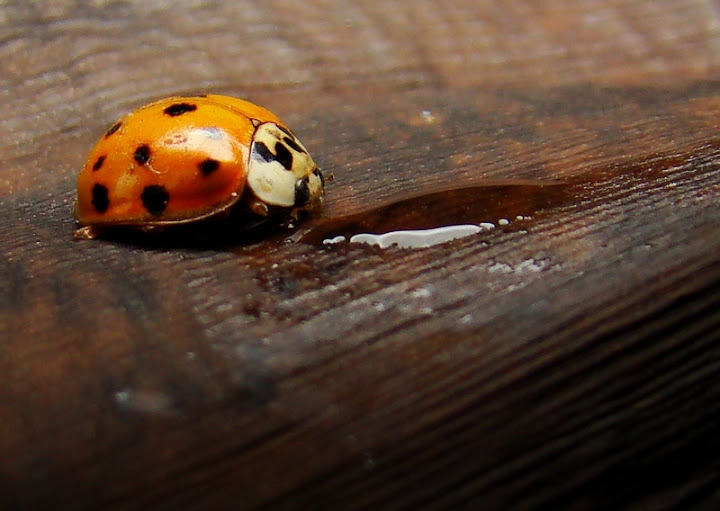 Harmonia axyridis, the Asian Ladybird Beetles are out of hibernation, and are amassing in homes, again, as the breeding season approaches. Most of the already-hiding ones in my home are all awake, and I can see many more out in the balcony. I wrote on these beetles during fall, where they invaded homes seeking shelter. This time, however, they are much less in number. A Queen ant - Camponotus sp. * OR Prenolepis sp.? The most interesting sight was that of an ant – a Camponotus sp. This ant was a Queen Ant, who had recently shed her wings. Queen Ants (besides Drones) possess wings, which are shed after the “nuptial flight”. The Queen then goes in search of establishing a new colony. This Camponotus sp. of ant was seen walking weakly on the snow. It was a surprise to see a Camponotus Queen out in the snow so early in spring. Now such ants are very common in homes – called Carpenter Ants. This Queen perhaps flew off from a home-based colony of ants, and wandered off into the woods. Camponotus sp. * OR Prenolepis sp. Carpenter ants are considered pests all over the world, since they damage woods. However, unlike Termites – who eat wood, Carpenter ants bore through the wood to create a colony. These ants, in wild, would make nests in dead wood or live trees, some species are known to nest in ground as well. *This ant could very well be a Prenolepis sp., female that are commonly known as False Honey Ants or Winter Ants. The females and males hibernate underground during winter months and awake early in Spring. They are the only ants to be up and early here in southern Ontario as soon as snow starts melting. Seeing Queens of these ants is much common than seeing a Camponotus sp. Queen. Any further help with the identification is appreciated. 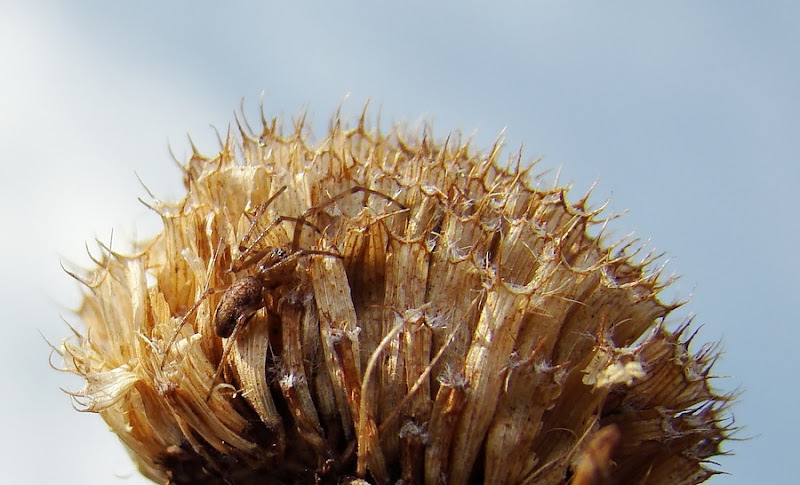 Another surprise was a tiny Orb-weaver sitting well camouflaged on a dry plant. This spider belongs to Araneidae – the family of Orb-weaving spiders. It was very small in size, less than 10mm, and lacked the orb-web. There are records of Orb-weaving spiders during winter, and seeing one in early spring is common. A Tetragnatha or Pachygnatha sp. Tetragnathidae, a family of “Long-jawed Orb-weavers”, which I spoke about in the previous post on Medway Creek, were also abundant. These spiders are also known to build orb-webs, but unlike Araneidae, the Orb-webs of Tetragnathid spiders are either at an angle, or horizontal. 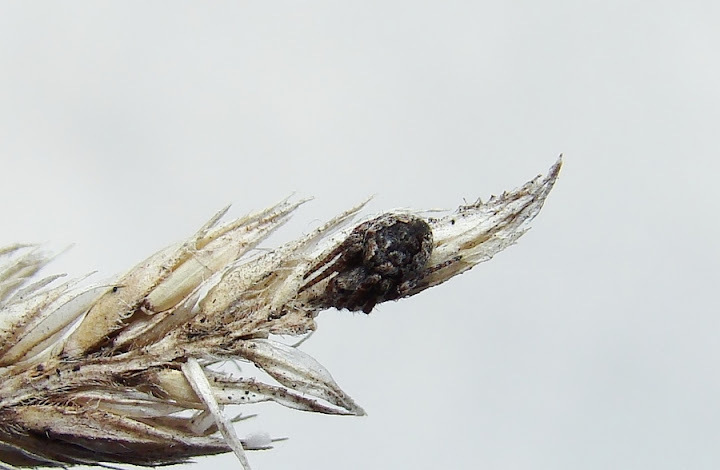 This spider was sitting on dried inflorescence, well camouflaged and hidden from the birds! The birds were very active, singing and fluttering from branch to branch. 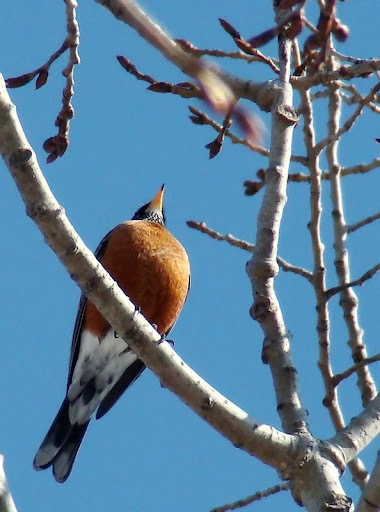 The first birds to be seen were American Robins in a flock of ten. I saw them last during late fall, when they used to gather in numbers during rains and feed off on earthworms. They vanished as first snow came down. According to Hinterland Who’s Who website, “In the spring, they begin their northward movement in late February and do not arrive in any numbers in Canada until early March. The temperature rise in spring is the key factor to their migration, for the birds need thawing ground so that they can dig up earthworms… American Robins return to the same breeding area they had frequented the previous year.” They are sure to stay here until November! The Robins have a very pleasant call, and are a commonly heard before being seen across the river in higher canopies, with a few seen on the ground, searching earthworms. The breeding season falls during this period, and eggs are laid in late April or early May. Red-tailed Hawks are busy with their courtship displays, since their breeding season is here. There were three initially, but now-a-days I only see two. I presume the one circling the other is the male – this is a part of the pre-nesting courtship. These Hawks are seen year-round, and I have been seeing these since September. The Downy Woodpeckers are seen more commonly than ever. I also probably sighted a Hairy Woodpecker, but do not have photographic records of it. I saw three Downy woodpeckers at Medway Creek and four along Thames River, all of them pecking on tree trunks for food. The very shy Northern Cardinal has always eluded me. I have never had a clear photograph of this bird, since it always manages to notice me and hide in the thickets. Northern Cardinals are resident birds, in the sense, they are seen year round. Northern Cardinals have a sweet call, often whistling on high perches. I have never seen a female in London yet, perhaps because they are not as conspicuous as their counterparts. This bird is common at birdfeeders – best place to photograph them. The Chickadees are also resident birds, common throughout the season, but very elusive and quick. The Black-capped Chickadees have a beautiful call, a whistle that fills up the woods. They are common high in the canopy, but often come down on ground in search of insects. I have not managed a decent shot of this common bird yet due to their restlessness. However, this bird is considered curious and will come close to observe you. A pair of Canada Geese, planning to settle at Medway Creek! I have been watching a pair of Canada goose fly to-and-fro along Medway Creek. After several days, I saw them settled down by the creek. This pair is probably looking for a place to nest. Canada geese pair for life, and if one of the pair is killed, the other will find a new mate. According to Hinterland Who’s Who, “Canada Geese breed earlier in season than many birds. Breeding is timed so that the eggs hatch when the plants that the goslings eat have their highest nutritional value… Canada geese of temperate areas nest as early as mid-March.” In London, Canada geese are resident and very common along the river and wide lawns. One of my favorite birds, Cedar Waxwing came pretty close for a decent photograph. There were several individuals in a flock busy looking for insects on the trees and filling the air with their high pitched whistle. According to BirdWeb, “Cedar Waxwings are nomadic and irruptive, and wander in search of food sources, rather than undertake a typical migration.” Cedar Waxwings are primarily frugivorous, but are known to eat insects. The flock I saw was pecking on tree trunks, probably on Stoneflies that were everywhere. Cedar Waxwings are irruptive, as said earlier, and thus appear randomly at any location that is especially rich in fruiting trees. These Medway Creek visitors probably came from south, as the climate became warmer. They will probably go northwards still, depending upon their will. They will however be seen where food is plenty. Other common birds along Thames River were American Goldfinches. I saw a flock that was loud and quick, chirping in the canopy. The males and females were draped in non-breeding plumage. These birds, too are resident throughout the seasons, are common at birdfeeders, and often seen in flocks of tens. They will adorn the breeding plumage when spring season peaks. There were many Song Sparrows around too. Song Sparrows are seen year round, but more common during spring – perhaps due to their excellent vocal skills. They are a common sight along Thames river watershed, browsing in the thickets for insects. Song Sparrows are so-called because of its use of melodious and complex songs. According to Wikipedia, “Song sparrows typically learn their songs from a handful of other birds that have neighboring territories. They are most likely to learn songs that are shared in common… they will choose a territory close to or replacing the birds that they have learned from.” There are 24 subspecies, which can be differentiated on minute features, hence Song Sparrow is considered to be a cryptic species. When it comes to photographing mammals, my camera just fails to focus. It is two years old now, and I completely sympathize with its condition, since it has always accompanied me everywhere, from hot and humid temperatures in southern India to near freezing temperatures in Canada. Anyway, I was glad to have seen the droppings – if not the actual animal – of the Eastern Cottontail. I spent some time researching how to identify mammals by their droppings. It was easy to know it belonged to a herbivore, and the commonest ones here are either the White-tailed Deer or Cottontails. Then I came across some references that fit the description of the picture. The Cottontails are common rabbits in southern Canada. They are seen year-round, but I have only seen it once. I came across a network of rabbit trails at Medway Creek when the snow was just melting. Besides Cottontails, I have been seeing a White-tailed deer doe along with her two adolescent fawns often at Medway, but never when I’m with a camera. I did come across their droppings, which are very distinct from that of Cottontail, if you observe closely. Other common mammals such as raccoons were only seen once (in the night) at Medway Creek, but there were many pugmarks on a trail along Thames River. The Eastern Gray Squirrels were seen in surprisingly large numbers after a long period of freezing temperatures. This fellow was basking in the noon sun, keeping one eye on me. The dark fur coat was pretty dull, but I am sure it helped the squirrel absorb more heat than the natural, gray fur ones. I had written on the Eastern Gray Squirrels in August, where I wondered why is there more number of black coated Eastern Gray Squirrels in London, as compared to Mississauga or Toronto. The answer lies in the geographic location of the two places. If you compare the weather of Toronto to London, you will see that London is much colder than Toronto –this maybe because London lies in the valley of Thames River. London also has more amount of snow, as compared to Toronto. Thus, squirrels with a dark color coat manage to absorb more heat from the atmosphere, thereby keeping them much warmer as opposed to lighter, gray coat. This could be a reason why we see more dark-coated squirrels here in London. My favorite subject of photography was an Eastern Chipmunk. It is a member of Sciuridae, the family of Squirrels. Chipmunks, in general, build an extensive burrow system of tunnels and chambers. They prefer dense undergrowth, and their territories change according to the fruiting/ breeding season. The diet includes seeds, fruits, nuts and insects. There were three Chipmunks on the trail at Thames River, all of them playing and curiously watching me. They seemed to follow me just along the path, but did not come any further as I walked away – perhaps because of the end of their territory. They undergo hibernation during harsh winters, when they retreat in their burrows and enter a state of torpor. They are, however, known to wake up to feed on stored food. The walk was refreshing as always, but I expected more activity in the insect diversity. The weather is cloudy, and it is expected to snow again.